When I first saw the title I thought this article was about the risk of wearing overly flamboyant clothing. WHEN appointed vice-president of General Electric Company and, therewith, director of one of the very top research laboratories of the world, Chauncey Guy Suits was only 39. Scientific research is, to be sure, a “young man’s game,” but administering a staff of 550 men and women scientists is another matter—to say nothing of planning a new $8,000,000 research laboratory for a staff of 800. But the biggest challenge for Dr. Suits is sitting at the desk just vacated by Dr. William D. Coolidge, who, in turn, took it over from Dr. Willis R. Whitney: both men of world repute, and both still amiably active in Schenectady. (If the spot feels a bit tight, Dr. Suits can recall that Dr. Whitney was only 32 when, in 1909, he became GE’s first director of research.) The size of the job, however, is nothing new to Guy Suits. During the war he headed the work of putting the enemy’s radio and radar out of action; engaged more than 1,000 engineers and scientists, spent $31,000,000, nullified the $2,000,000 German radar system and thus saved uncounted numbers of Allied planes and flyers. And he has accumulated some 60 patents of his own, on high-temperature arcs, railway block signals, submarine signals, and photoelectric relays. His bearing shows the leadership in him. He is almost the typical engineer-scientist, earnest and confident, with quick, penetrating eyes, a man of few but direct words and an air of authority that is based on mathematics and hard facts. Yet the future history of GE—and therefore of American industry and of American life—will depend as much on the man himself as on his professional competence. He claims to be normal, not at all of the genius type that has sat at his present desk for 45 years. If by normal he means human and lovable, he is right. Guy Suits, born in Oshkosh, Wisconsin, March 12, 1905, was graduated from the University of Wisconsin in 1927. By then he had already decided that he wanted to work for GE, but he secured a fellowship from the Institute of International Education, spent two years in Switzerland, and in 1929 won the degree of Doctor of Science at Zurich. Then he went with GE in Schenectady, and in 1932 married Laura Struckmeyer, who had been a fellow student at Wisconsin. By 1940 he was assistant to the director of the GE research laboratory. What makes Dr. Suits normal, and certainly human, is his insatiable yen for hobbies. Before he entered high school he took up music; at the University was a member of both the band and the orchestra, taught clarinet in the Madison School of Music and otherwise worked as a professional musician. That made up financially for the untimely death of his father. Guy’s oldest interest is in skiing, much stimulated by his years in Switzerland. In Schenectady he played an important part in the organization of the Wintersports Club and in the inauguration of snow trains. But he was not satisfied with his skis. His passion for experiment led him to buy woodworking machinery, with which he turned out more than a dozen pairs of skis of his own design. From this introduction he became fascinated with woodworking for its own sake and started to build tables and cabinets. Today half the furniture in his home is Suits-built; also the envy of friends, for Guy is a finished craftsman and takes pride in reproducing fine antiques. In his circle, woodworking is a most respectable hobby. Another early hobby was photography. That led him to a close study of the resolving power of lenses, which in turn solved many a problem for him in work on the electric arc. Recently Dr. Suits has returned to playing his clarinet, though his greatest enthusiasm now runs to oriental rugs and the mechanics of weaving them. He has a fine collection of good rugs, some of which were once battered specimens he picked up at auctions. He restored them himself by reweaving the worn areas. This confirmed hobbyist once sent a questionnaire to engineers in the GE organization and thus discovered that the average engineer there spends about 12 hours a week and $130 a year on his hobbies. 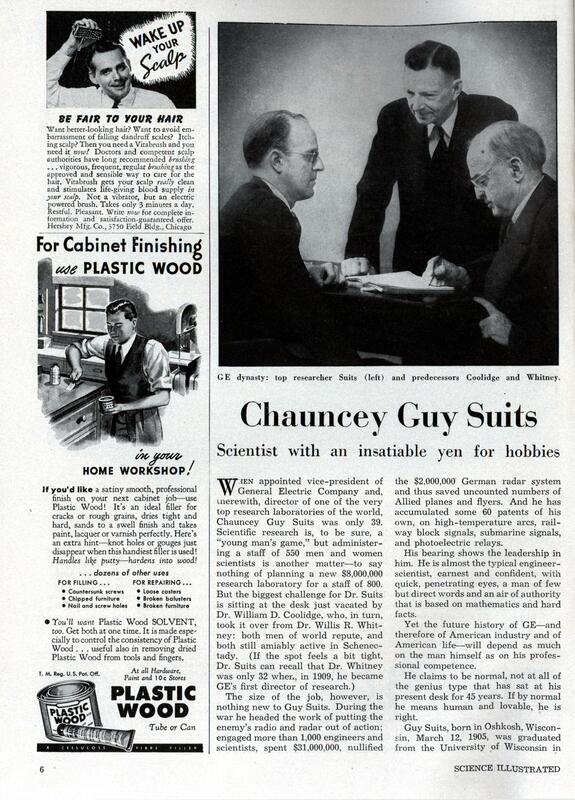 Guy Suits would sympathize with and encourage the thousands of readers of Science Illustrated who are constantly asserting their interest in hobbies and amateur science. Dear Sirs: Please send me one of your Eveready battery powered bowling ball cannons. And naming your kid “Chauncey Guy Suits” is worse than naming him Sue! 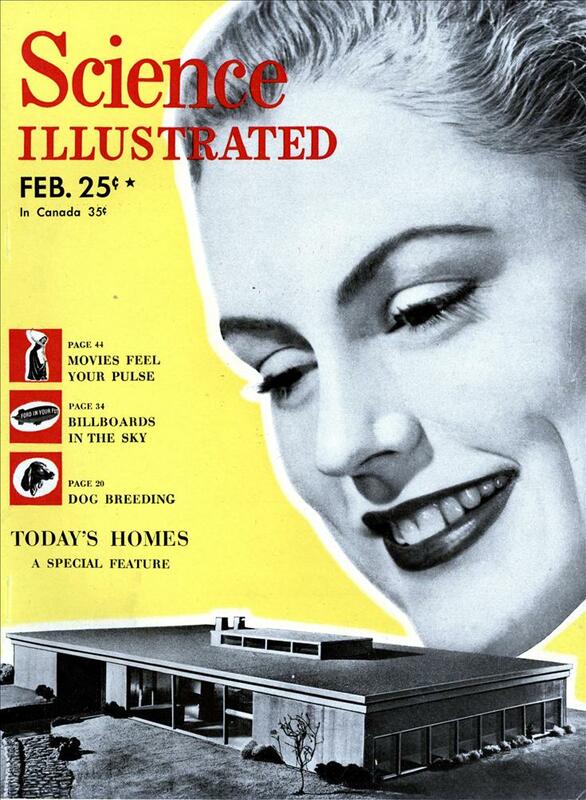 Plastic Wood…..what a primitive product that was. I found it hard to work with. Today’s fillers are so much better. “Suits” is such an unusual last name. I have to wonder where it came from. Baker, Cook, Robinson, etc. are all fairly obvious in their etymology. But Suits? Weird. Suits is probably an Americanization of the Dutch surname Switzer, which in turn means “person of Swiss ancestry”. It’s most common in areas of New York colonized by the Dutch.